The top drones reviewed here all have excellent 4k cameras, GPS and autopilot systems giving you many options when it comes to flying, aerial filming and photography. Many of these drones have incredibly low prices due to the competition in the drone sector. These top drones all have 4k cameras and can be flown by pilot manually or on autopilot. A drone flying on autopilot has many advantages over manual flight. A drone on autopilot can fly a programmed route called waypoints and take aerial photos and video much better than any pilot can. This is especially true in difficult weather conditions. A drone flying in autopilot mode is monitoring and adjusting its position thousands of times per second. Manual flying will never be able to achieve this flight accuracy. For aerial photography, it is great to let the drone fly on autopilot on a given route, while you concentrate on working the camera capturing the best of video and stills. Having a drone with a GPS autopilot flight system and a 4k camera is very essential for aerial photogrammetry, 3D mapping and multispectral imaging. Many of the below drones can be used on farms. For applications such as crop monitoring and site surveying, letting the agricultural drone fly on autopilot is a great option. Agricultural drones generally carry multispectral imaging cameras. The 12 top drones reviewed here are full of innovation and this post is right up to date. These drones are also very affordable. All drones have advanced GPS systems, intelligent autopilot systems, advanced stabilization technology and top of the range 4k cameras. One of the most sought off features is follow me technology, which all the below drones have. Many of the below drones also have collision avoidance technology, which give you an increased level of safety when you are flying and filming. If you would like to learn more about unmanned aircraft, then read this drone article, which describes the technology very easily. All of the drones featured below are all very easy to fly. Many of the above drones have dual GNSS with coverage from both GPS and GLONASS giving extra satellites and full coverage no matter where you are on the globe. Also many of the above drones have excellent 4k cameras with great automatic settings and many manual settings. The drones with the best autopilot modes are the Mavic 2 and Phantom 4 Pro. The new Mavic 2 Pro and Mavic 2 Zoom editions just released on 23rd August 2018 has some major advancements over the previous Mavic Pro, which I also discuss below. Both Mavic 2 versions and the original Mavic Pro are close in looks. However, the Mavic 2 Pro and Mavic 2 Zoom are far superior. The only difference between the Mavic 2 Pro and the Mavic 2 Zoom is the camera. So I have separated these below. The Mavic 2 is faster, quieter and can fly further. Obstacle sensing is now on all 6 sides with front and back collision avoidance technology, allowing the Mavic 2 to fly around obstacles. Below, we look at the Mavic 2 GPS, Cameras and Autopilot modes. To find out more on these new DJI quadcopters just released, the read our full Mavic 2 Zoom and Mavic 2 Pro review, which also includes some terrific videos. Here is the DJI introduction to the Mavic 2 Pro and Mavic 2 Zoom with dual GPS, superb 4k camera including the Zoom option and so many autopilot modes. Both Mavic 2 Pro and Mavic 2 Zoom use both GPS and GLONASS so the quadcopter connects up to many satellites. The dual satellite system is used in many of the features on the Mavic 2 including precision flying, return to home, obstacle avoidance, waypoints, points of interest and much more. To fly your quadcopter safely it is important to have a strong GPS signal, which is why dual satellite systems are the best. GPS is also essential for the geotagging of aerial photographs for photogrammetry using 3D mapping software. H.265 Codec For Higher Image Quality – The Mavic 2 Pro records 4k video at a higher bitrate with advanced H.265 compression. Videos in H.265/HEVC codec maintain 50% more information than videos in H.264/AVC, creating high-quality videos with better-preserved details. Max Video Bitrate: 100 Mbps. The Mavic 2 Zoom camera allow you to capture everything from wide angle to mid-range shots giving your aerial photography and videography new creative perspectives. H.265 Codec For Higher Image Quality – The Mavic 2 Zoom also records 4k video at a higher bitrate with advanced H.265 compression. Videos in H.265/HEVC codec maintain 50% more information than videos in H.264/AVC, creating high-quality videos with better-preserved details. Here is a beautiful video filmed using the Mavic 2 Zoom up in Alaska. The vivid color and sharpness of the film is outstanding. DJI released the new Mavic Air in January 2018. In size, it fits between the Mavic Pro and Spark quadcopters. While it is called the Mavic Air, it has massive improvements on both the Mavic and Spark drones. It is perhaps the ultimate small drone. This Mavic air quadcopter now has front, below and backward dual vision sensors. It also has a downward infrared sensing system. Both Vision and IR work together to give you extra flying obstacle detection and collision avoidance. The new DJI Mavic Air uses both GPS and GLONASS which means the quadcopter will pick up maximum satellite connectivity, up to 20 satellites. The Mavic Air portable drone has a 3-axis mechanical gimbal. The integrated gimbal camera is set differently in a triangular formation and along with new gimbal dampener technology helps create even steadier shots than any other quadcopter in this sector. The Mavic Air shoots video in 4k at 30 frames per second, recording at 100 Mbps to capture every second in ultra high definition quality. To capture slow motion video, the Mavic Air supports video recording of 1080p at 120 frames per second. The Mavic Air’s camera integrates a 12-megapixel CMOS sensor and an f/2.8 lens with a 35 mm equivalent focal length of 24 mm to shoot high-quality photos and videos. In addition to a Micro SD card slot, there is an 8 GB of internal storage, which allows the saving of photos and videos directly to the quadcopter. This new Mavic Air has the following autopilot intelligent flight modes. 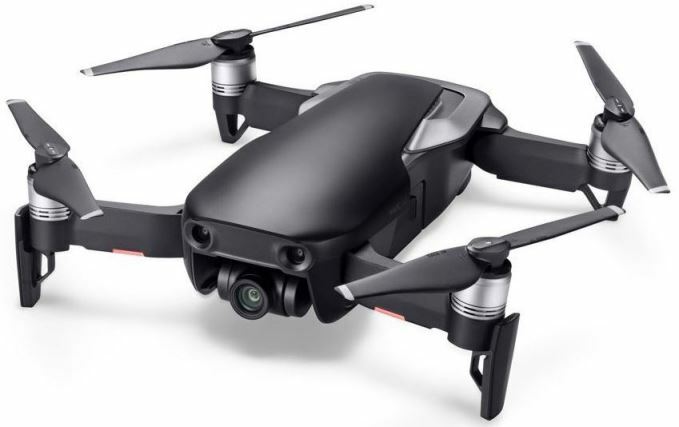 You can read the full Mavic Air review which looks at all the features such as hand gesture recognition, APAS collision avoidance, ActiveTrack follow modes, TapFly, QuickShot technology and much more. The Mavic Pro was first fold up drone from DJI. While this quadcopter is small, it does not lack in technology. 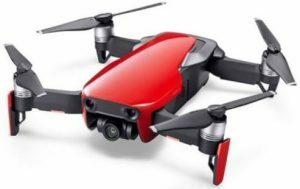 It flies perfectly still both outdoors and indoors, has collision avoidance sensors, a terrific 4k camera and many auto pilot flight modes. Now, DJI have released their latest Mavic 2 Pro and Mavic 2 Zoom highlighted above. Up to 23rd August, the Mavic Pro was the one of the best drones on the market. It had longer flight time and more camera options then even the Mavic Air. So the Mavic Pro is still a top drone with dual GPS, top 4k camera and many autopilot flight modes which make flying and filming very easy. Because the Mavic 2 has come on the market, you will now get even better Mavic 2 bundle offers, which give you the quadcopter, extra batteries, props, chargers carry case and much more. Lets look at the Mavic global positioning systems, autopilot modes and camera. All DJI drones now use dual satellite connectivity using both GPS and GLOSNASS navigation systems. The Mavic Pro also uses both. These dual satellite navigation systems can give you a maximum connectivity of up to 20 satellites. Which means you should never loose a signal outdoors. Along with the 2 vision sensors and satellite systems, the Mavic has terrific return-to-home point and a new more precise landing technology. The technology is called “FlightAutonomy” and is made up of 7 components including 5 cameras (forward and downward dual vision sensors and the main camera), dual-band satellite positioning (GPS and GLONASS), 2 ultrasonic rangefinders, redundant sensors, and a group of 24 powerful, specialized computing cores. The dual forward and downward vision sensors require visible light to function, and in bright light can see as far as 49 feet out in front. This obstacle avoidance system is activated in all Intelligent Flight Mode including all ActiveTrack modes, TapFly and Terrain Follow. It is also available during automatic Return to Home, so that the Mavic can easily make its way back without bumping into anything in its path. The Mavic uses 4 Vision Sensors which sees in front and below whether you are on a cliff or in a forest. These vision sensors also work indoors giving it the smoothest flying and hovering of any drone to date. The Mavic Pro has many autopilot modes which make flying and filming so very simple. Here is a look at the Mavic Pro autopilot modes. DJI’s engineers designed the stabilized gimbal to be smaller than ever. This camera is able to use every single pixel giving you crystal clear photos and film. With brushless motors on all three axes, the gimbal can control the camera with precision, adjusting it to eliminate shake caused by the movements of the Mavic. This 4k camera uses core technologies found in all DJI cameras. It is equipped with a 1/2.3 inch CMOS image sensor, commonly found in professional sport cameras, and an aerial imaging optimized integrated lens with an equivalent focal length of 28 mm. this allows the camera to provide smooth 4K video at 30 frames per second, 1080P video at 96 frames per second and 12 megapixel photos. The Mavic Pro has many more terrific features including a 4.3 mile (7 km) transmission range. Because of its size, excellent fight stability and top notch camera, the DJI Mavic quadcopter produces stunning images. This makes it excellent for producing top quality still shots, aerial film and also for creating 3D photogrammetry images. There are now 2 versions of the Mavic Pro with the Pro Platinum is the latest just released. You can read further on the fantastic features along with watching great videos on the DJI Mavic Pro here. The article also contains a review of the Mavic Pro with videos and answers to your frequently asked questions. 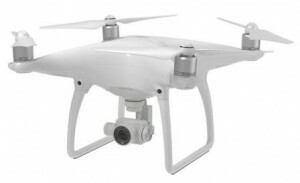 The DJI Phantom 4 Pro is a top of the range professional drone. The Phantom 4 Pro can be used for professional filming and can also be used to create 3D photogrammetry imagery. For perfect 3D imagery, the drone GPS, autopilot system and camera needs to work seamlessly. The Phantom 4 Pro does all there perfectly. Also required to create 3D maps of land mass or buildings, you also need to use the best photogrammetry software. The Phantom 4 Pro is perhaps the most frequently used drone commercially. You can read about the hundreds of terrific uses for drones here. The Phantom 4 draws on up to 24 satellites to give you more accuracy and a faster connection to satellites. It uses a combination of GPS and GLONASS. The Phantom 4 is completely aware of its starting point, location and relation to you during flight. These intelligent flight system means it knows its last position, provides return to home, shows you where it is on a map and much more. The Phantom 4 flight autonomy systems make flying and filming so very easy. However, to make flying and filming this easy, there is some serious technology behind it all. 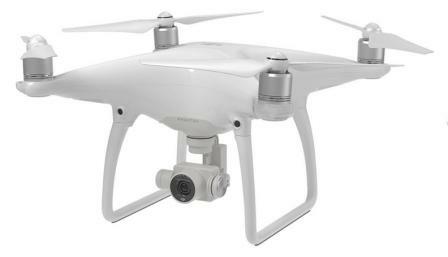 The Phantom 4 Pro uses a complex network of ten component groups including seven cameras — forward, rearward and downward dual vision sensors and the primary camera — an infrared sensing system, dual-band satellite positioning (GPS and GLONASS), two downward facing ultrasonic rangefinders, redundant IMUs and compass, and a group of powerful, specialized computing cores. The Phantom 4 Pro acquires a real-time view of its environment and information about the height and position of nearby obstacles to create a 3D map it can locate itself within. The IMU and compass collect crucial flight status, speed and direction data, while redundant IMUs and compass monitor critical data and rule out possible errors, dramatically enhancing the reliability of flight. You can read further on these on the Phantom 4 Pro Intelligent Flight Modes here. Flight Autonomy on the Phantom 4 Pro uses a set of high-resolution stereo vision sensors placed at the rear in addition to the pair placed at the front as well as infrared sensing systems placed on the left and right sides. This network creates a total of 5 directions of obstacle sensing and 4-direction of obstacle avoidance, protecting the Phantom 4 Pro and allowing the pilot to be more adventurous in their flying and filming. The Phantom 4 Pro camera system has been significantly upgraded from the Phantom 4, improving every part of the camera including, sensor size, resolution, image processing system, and more, making it the most powerful Phantom camera ever. The sensor size is more important to image quality than the number of pixels because a larger sensor captures more information in every pixel, improving dynamic range, signal-to-noise ratio, and low light performance. The 1-inch 20-megapixel CMOS sensor in the Phantom 4 Pro is almost four times the size of the Phantom 4. An enhanced video processing system allows video to be captured in cinema and production optimized DCI 4k/60 (4096 x 2160/60 frames per second) at a bitrate of 100 Mbps, enabling you to get high-resolution slow motion shots. The Phantom 4 Pro also supports the H.265 video codec (Maximum resolution 4096 X 2160/30 fps). DJI have sales and discounts on throughout the year. You can find the latest Phantom 4 bundle offers here along with reading more on its outstanding features. Here is a terrific Phantom 4 review video. It has to be the most innovative drone to date. The Inspire 2 released in November 2016, takes everything that was great in the Inspire 1 and further improves on it. It has an all new image processing system which records at up to 5.2K in Cinema DNG RAW, Apple ProRes and more. It goes from 0 to 50 mph in just 5 seconds and hits a maximum speed of 58 mph. A dual battery system prolongs the flight time to a maximum of 27 minutes. An upgraded video transmission system is now capable of dual signal frequency and dual channel, streaming video from an on-board FPV camera and the main camera simultaneously, for better pilot and camera operator collaboration. The Inspire 2 uses both GPS and GLONASS satellite systems which can locate up to 24 satellites giving you more accuracy and a faster connection to satellites. The Inspire 2 supports control over 4G. However, a USB dongle and SDK development is required. This high bandwidth allows the Inspire 2 to transmit high quality videos to a network server or can be used for ultra-long distance control. It also cuts video transmission latency to 500 miliseconds. Sense And Avoid – Forward and downward vision systems enable the Inspire 2 to detect obstacles up to 30 meters ahead, allowing for protected flight at up to 34 mph at a controllable attitude angle of 25°. Upward facing infrared sensors scan obstacles 16 feet above, adding protection when flying in enclosed spaces. Spotlight Pro – is a powerful tracking mode which uses advanced visual tracking algorithms to lock onto a subject during flight, regardless of the direction that the Inspire 2 flies, creating shots that would once have required a dedicated camera operator. If the gimbal comes close to reaching its rotation limits,the Inspire 2 itself will rotate in the same direction without affecting flight control or the shot being captured to free up gimbal movement. Spotlight Pro is available in all Intelligent Flight Modes. Integrated into the Inspire 2 is the brand new CineCore 2.1 image processing system, capable of recording 5.2k and 6k videos in Cinema DNG, 5.2k videos in Apple ProRes and more. CineCore 2.1 is built into the aircraft nose and works with any camera connected through the dedicated gimbal port. At present the Zenmuse X4S, X5S and X7 gimbal / cameras are compatible with the Inspire 2. Equipped with an up-rated Micro 4/3 sensor, the Zenmuse X5S has a dynamic range of 12.8 stops. It supports up to eight standard M4 / 3 lenses (including zoom lenses) with focal lengths ranging from 9 mm – 45 mm (equivalent to 18 mm – 90 mm on a 35 mm camera), allowing more creative flexibility. The new CineCore 2.0 image processing system on the Inspire 2 makes the Zenmuse X5S capable of capturing 5.2k at 30 frames per second. CinemaDNG video and Apple ProRes video as well as 4k at 60 frames per second using H.264 and 4K at 30 frames per second using H.265 (both at 100 Mbps). Continuous DNG burst shooting at 20 frames per second with 20.8 MP images is also supported. The Zenmuse X5S was designed for high-end professional aerial imaging. The Zenmuse X4S is a powerful camera featuring a 20 megapixel 1-inch sensor and a maximum ISO of 12,800. Dynamic range is increased from the Zenmuse X3 by 1 stop, with signal to noise ratio and color sensitivity increased by 1.5 stops for next-level image quality. The Zenmuse X4S uses a DJI-designed compact lens with low dispersion and low distortion 24 mm equivalent prime lens. This 84° FOV, high resolution lens makes the Zenmuse X4S as powerful during aerial imaging as it is on the ground.Combined with CineCore 2.0, the Inspire 2’s powerful image processing system. It can record 4K at 60 frames per second and 4K/30 frames per second, H.265 videos at a 100 Mbps bitrate and over sample 5.2K video into 4K video in real-time, capturing fine image details. In Burst Mode, the Zenmuse X4S supports 14 frames per second shooting at 20 megapixels in both JPEG and DNG formats. It is able to make the difficult balance between agility and image quality. The next video show the outstanding quality of filming which can be achieved using the DJI Inspire 2. This was filmed entirely with the Inspire 2. Not just the aerial shots but also the close-ups of the actors and indoor scenes too. Compared to other top market cameras for filming, the Inspire 2 is absolutely great value. The camera is integrated into the CGO3+ gimbal. The 3-axis anti-vibration CGO3+ gimbal camera captures ultra-stable video and vivid still images and can be rotated in an unlimited, 360-degree range of motion. The Yuneec Typhoon H Pro model uses the Intel Real Sense Collision Avoidance technology. Again, with this drone sector so competitive, the Yuneec Typhoon H price great value right now. Here a look at this beautiful Typhoon H. This is another drone which has everything. It has strong GPS technology, great autopilot flights modes and a top camera to film with. The Scout X4 from Walkera Technology features a new advanced GPS flight control system which allows for a more accurate flight along with terrific GPS position holding. The Failsafe Return To Home feature is part of this GPS flight control system. The GPS mode allows for 1 button start and hold feature. The Walkera Scout X4 features waypoint mission planning. You can program an incredible 128 waypoints including flight designation through your touch screen tablet or phone and using the Bluetooth ground station device which is part of the package. Another terrific feature is the ability to circle a GPS waypoint. All Walkera drones are packed with innovation and features. The Scout X4 has built in “Follow Me” mode and flies for longer than most drones up to 25 minutes. It can change from a quadcopter with 4 motors into an multirotor with 8 motors for even more power. The legs or landing gear are also retractable which is terrific for filming. 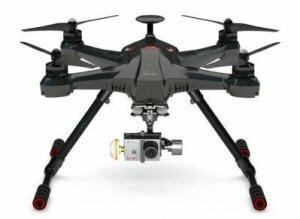 This comes with an integrated 3 axis, G-3D brushless gimbal. The camera is the iLook+ which shoots film at HD 1080p video and at 30 fps. The X4 also has the built in 5.8ghz transmission system for seamless up-link to the Devo F12E Transmitter, a wide angle lens, and the ability to take high quality photographs, all controllable from the transmitter. Other cameras equipment can be used with the X4 including the GoPro Hero 3 or Hero 4 action cameras. The Walkera Scout X4 price on Amazon starts at about the $850 up to the $1400 for a full package. Here’s a terrific video showing you the Scout X4 Autopilot Ground Station along with all many more terrific features. The Mantis Q quadcopter is the latest small sized quadcopter from Yuneec. It is small and light with a total weight of less than 17 ounces (480 grams). For such a small drone, it has some terrific technology packed into it, including face detection and voice control. With a flying time of 33 minutes. In sports mode, the Mantis Q can fly at a top speed of 44 mph (72 km/h). This DJI Mantis Q flies superbly to your touch and it is incredibly agile. So you are going to have some great flying fun with this quadcopter. Using its IPS (Indoor Positioning System) the Mantis Q can be flown safely and very stable at speeds of up to 9 mph (15 km/h) indoors where neither GPS nor GLONASS satellites are available for positioning. You can check the current location of the Mantis Q at any time via a map displayed in the app (map display requires an Internet connection). The Mantis Q price on the Yuneec website is USD $499.99 with extra free props with your purchase along with the quadcopter, Remote Controller, Charger, 1 Battery, 2 Sets Propellers and USB Cable. Here is a nice introduction the the Yuneec Mantis Q. I love the way it flies super stable indoors. Most quadcopters will start drifting while flying indoors but not the Mantis Q. The Vitus is the latest mini drone with 4k aerial camera just released by Walkera. It comes with dual mode global positioning satellite system. This 4k drone has exceptional design in that the quadcopter arms, landing gear and propeller blades can be folded. It is small and weighs less than 1 lb. The dual-module GPS/GlONASS satellite positioning system is able to obtain satellite positioning signals accurately and quickly. This helps to create more accurate and stable hovering at fixed heights and points. The Vitus camera supports 4k at 30 fps and 12 megapixel for still images. You can also shoot 1080p at 60 fps. The 85 degree ultra low distortion wide angle lens helps to keep the original details and gives very share and deep color to your aerial film. The X-Star Premium 4k drone is an amazingly easy to fly quadcopter. The 4K camera and 3-axis gimbal can record crystal-clear, smooth Ultra HD videos or take 12-MP photos with HD Live View up to 1.2 miles away. It also has an excellent flight time of 25 minutes. Learning to fly the X-Star is easy: you can start the motors, take off and land, hover, or have the drone automatically return home by using the one-touch buttons on the remote controller. The controller’s integrated LCD displays critical flight information, allowing the Starlink mobile app to show full screen live HD video. This 4k drone has a number of autopilot features such as follow, orbit, waypoints, and also lets you adjust camera settings and record images in flight. The Swellpro Splash 3 drone comes with a quick release waterproof 4k camera gimbal called the 4k GC-2, an all in one FPV remote controller, brand new design flight control system, improved second generation power system, quick release FPV payload release, brand new design carry and storage case. Swellpro’s waterproof gimbal, the 4k GC-2 is a massive achievement and success. Many drone manufacturers have tried and failed to build a waterproof gimbal and drone. Yuneec Breeze 4k – Both convenient and compact, Breeze is controlled by your iOS or Android device with the Breeze Cam app and weighs just under 1 pound. Very easy to fly and capture aerial photos and video in stunning 4K Ultra High Definition. Read this fantastic Yuneec Breeze review here along with a excellent review video. Yuneec Typhoon 4k – One of the best value 4K drones available, an included Android touchscreen controller means faster setup and no need to add your own mobile device to capture impressive 4K video. Typhoon 4K also captures 1080p @ 120 fps slow motion video with a full complement of manual camera settings for total creative control. Perfect ground shots are also available with the included Handheld SteadyGrip™. Read further on the many features of the Yuneec Typhoon 4k.